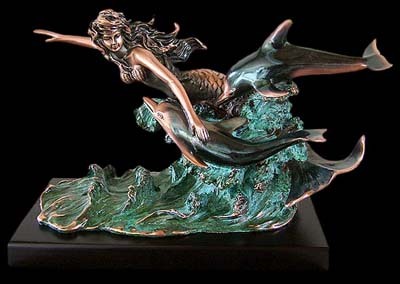 Experience the beauty and elegance of this Copper Coated Mermaid and Dolphins Sculpture. This quality finish artwork shows charm and beauty, value and style of a new aesthetic trend. Our goal is to bring the highest quality artworks into your home or office. This art piece is handcrafted to the finest detail, as well as lasting durability. It is sure to be treasured and adored by all.